I had heard of it for years. Ever since I started roaming up and down the California coastline people talked about the area. ‘Have you ever been? You should go…’ I had never been nor knew much of it, but recently a couple friends of mine talked about making the trek. North to south. 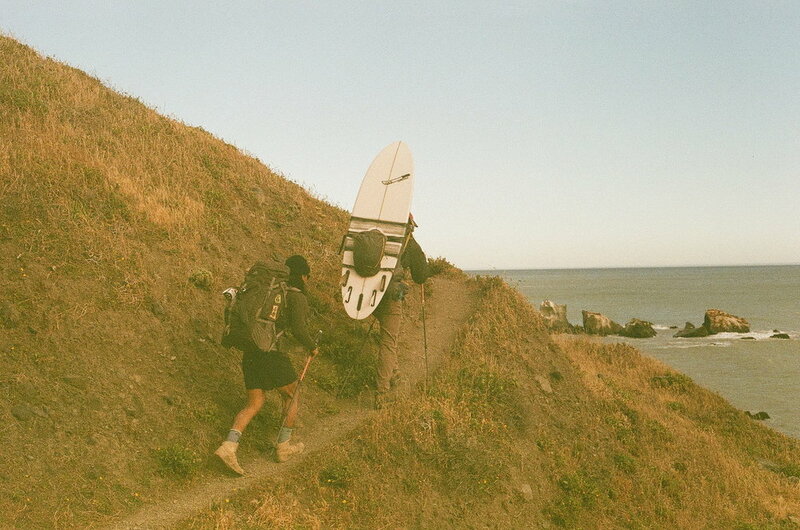 They wanted to hike the 25 miles of rugged coastline with gear and surfboards on their backs in hopes to get away and score some waves. They called it “The Lost coast,” as there were no direct roads that ventured there. When they built highway one years ago they had to divert the road inland 30 miles due to the treacherous landscape of the area. This, without mankind’s footprint, made for beautiful stretches of pristine beaches and naturally provided a home to a multitude of wildlife that freely roam the land including black bear and a family of elk. This truly was one of the last wild frontiers left on this continent where one could get away and get lost for a while. Although I had never been on any sort of overnight backpacking hike, I immediately asked If I could join them. I knew it would be rough but figured I couldn’t pass up the opportunity, it may never come again Right? I trusted my friend for this type of adventure. They had a lot more experience than I did and had just recently climbed mount Whitney with ice picks. I thought “well if there’s anyone I would wanna go on this trip with, it’s these two.” They had all the equipment, I had nothing. I owned a backpack and some camping essentials but as far as boots and an actual overnight long-distance hiking pack I had nothing. It wasn’t climbing a mountain with ice picks, but I had heard of the miles and miles of unforgiving terrain and with a 30 pound back and surfboard strapped to my back I knew it was going to be a big test of my will and mind. I decided to use my head and do as much research as possible to prepare my head for the trip. I asked friends and spent hours searching google. To my surprise there wasn’t much. This worried me a bit, why weren’t more people doing it? Supposedly there was possibility of surf along the way, but was it worth lugging a board 25 miles just to find out? I quickly found out the hard part wasn’t so much the weight of your board, but the fact that it acts like a sail when the winds pick up, which is often. Besides finding that out, I read another article that highly recommended against beginner hikers attempting the feat. What the hell was I getting myself into? I said aw screw it and stayed on board. I began gathering my things that I did have, and reached out to a few companies for the things I didn’t. Teva gave me a pair of hiking boots that worked really well for the trek. Surf Durt gave us surf screen for our face and Bare Essientials hooked us up with sunscreen for the long miles under the sun. Everything else I had or borrowed. One pair of pants, one pair of boardshorts, three tee shirts, one long sleeve button up, a crewneck, three pairs of socks, a beanie and a hat. My friends-I met Ryder and Mario at their place in Encinitas and we planned on leaving early morning the next day. We cruised out before the sun rose to beat the always gnarly LA traffic and made pretty good headway our first day making it all the way up to San Francisco. This was as far as we could make it so we stopped at a buddy’s and crashed on the floor for the night. The next day we woke early and made the next stretch towards Mattole Beach, the beginning of the Lost Coast hike. Fifteen hours of drive time later, we pulled into a small dirt parking lot near the beach with a flat tire and began unloading our gear. We decided to fix the tire right there and then because we all knew there was no way we were going to want to fix it right after a four-day hike. The first hour of walking we quickly understood the harshness of the elements we would be living with for the next four days. Between the heat of the sun, the ever-changing ground beneath our feet and the high winds that thankfully pushed at our backs, we knew it was going to be a real test of will. On a positive note, we were surrounded by beauty, we had each other, water, food and high spirits. The three of us were born for adventure. It runs through our blood and we all felt calm knowing that with each of our skill sets, we could pretty much figure out anything that came along, as long as nobody got hurt. After trekking six hours our first day, getting lost, stopping for smoke and snack breaks along the way, we made our first camp at a spot above sea level called “Sea Lion Gultch.” Or as I like to call it, “Monster Bay.” All we could hear all night was the monstrous roars of the male sea lions that would have kept any kid up with the assumption that they were soon to be devoured. Somehow, we slept soundly and woke up to an amazing sunrise that truly made us feel alive and rejuvenated. We broke down camp, filled our water bottles at the stream just below, and made our way further south. One of the biggest threats and challenges of this trip was making sure we had plenty of time to cross the “impassable zones.” There was plenty of fair warning and we knew of the danger if we happened to get trapped in one of these high tide zones. We always made sure to give ourselves plenty of time to make it though while the tide was low. Making it through one of the biggest impassible zones on the hike, we began nearing our second camp at Spanish Flats, a wide-open flat area with driftwood sprawled about everywhere. We found a man-made driftwood fort and decided to use it as a home for the night. We beat the mid-day heat by trying to surf although the lack of waves, thick wetsuits, and freezing cold water made for a unique experience. So far, it wasn’t the surf adventure we had hoped it may be. Although our legs and bodies were tired and beat by the sun, we remained positive, eased our muscles with whisky and smoke, enjoyed the wild landscape surrounding us and trekked further south the next morning. Arriving early in the day, we knew we were there by the topography of the land. It was big, and flat, and there was ten times more driftwood scattered about than any place we had passed before. Wild deer were seen peacefully grazing here and there, they were some of the first wildlife we had seen other than the sea lions and a rattlesnake that was just trying to hide from the heat. At this point in the trip, we only ran into a few other hikers, making it easy to pick and choose were we wanted to set up camp. Being that nobody was around when we arrived we found the biggest driftwood fort around and made ourselves at home. We quickly unpacked our gear and made our way to the swimming hole that sits just above the ocean. Taking a dip and relaxing our muscles we soon saw other hikers arriving from the north and south. One of the first few people we met was a young father and son who were hiking south to north, the opposite of us. We greeted them and began chatting about the beauty of this place. They mentioned they were a family of avid hikers and had done this section previously. During conversation, I mentioned our predicament about not knowing how we were getting back to our car. At one point while chatting, I chirped up and said “we should give you our keys and you give us yours!” It seemed like a logical idea although at this point we were all strangers. There was no way some random person was going to give us his keys to drive his car 2 hours back to the start of the trail. Or was there? Of course, the boys were stoked and we felt comfort in knowing the outcome of our previous dilemma. We made our way over to their camp and grabbed the keys to a newer BMW, thanking them over and over for being so trusting. After exchanging information, we headed back to lay our heads down for a good night’s rest. I have never felt so much pain in my legs as I did that evening and worried if my body could handle the long stretch to the finish, but thankfully I slept well under the stars that night and woke the next morning fully rested and ready to keep moving south. On our last day we awoke early at the glimpse of sunlight peaking over the tree covered mountain side. Packing up our things and saying goodbye to our driftwood fort we started on our final section south to Shelter Cove. After three days of hiking, our bodies had taken a beating. It was the hottest day of the trip; our minds were strong but no one was acting tough anymore. We took lots of little breaks in between long miles of sand and shared the last few sips of whisky and snacks with a few other hikers we met that day. After a long 8 miles of walking on sand we finally made it to Shelter Cove. It was the ending point for us but thankfully had been the beginning for the father and son, which proved great for us knowing we had a car waiting in the parking lot above the beach. Although we were finished with the 25-mile hike, we knew we still had a long drive home to San Diego. We stayed with friends on the way back down, some in Santa Cruz and some in Los Angeles. We all felt that this adventure wouldn’t have been possible without good people helping us along the way. With that in mind, we offered to give the few people that completed the hike with us a ride back north to Mattole Beach in the BMW that wasn’t ours. We knew the owner wouldn’t mind, he would appreciate the ongoing kindness. As soon as we delivered the car and got ours back, we texted him and thanked him for his generosity. It was an amazing way to end such an epic journey and we couldn’t wait to see and share the photos and stories from our adventure along the Lost Coast. Words and Film photography by Dylan Bellingan.